ETD is pleased to announce the successful recent completion of a Thermo-Mechanical Fatigue (TMF) Testing project. A Middle Eastern client is currently performing research on advanced materials for Gas Turbines. One of the scopes of this research is to study the effect of thermal fatigue on gas turbine hot section components. The management’s interest is to conduct Thermal Fatigue Tests (TMF) on gas turbine blades and vanes. The client does not have the facilities and expertise to conduct these tests. Therefore, they decided to collaborate with international research companies which have the expertise and test facilities for thermal fatigue testing and are prepare to train their engineers in such testing, post-test data analysis, life assessment, and, support in technology transfer and capacity building. ETD were approached to send proposal for such a collaborative project by providing services for Thermo-Mechanical Fatigue (TMF) testing, TMF data analysis & Life assessment and provide material database with particular reference to GT Materials. Conducting TMF tests for gas turbine materials – ETD provided services for TMF testing. Dependent upon the size of the components being sampled, the tests were small-scale specimen tests on GT materials of interest to the client. Post Analysis of TMF Samples after Fracture – Post-test assessment was performed on all the TMF specimens after fracture. This analysis was performed to assess the damage and to determine the material degradation. 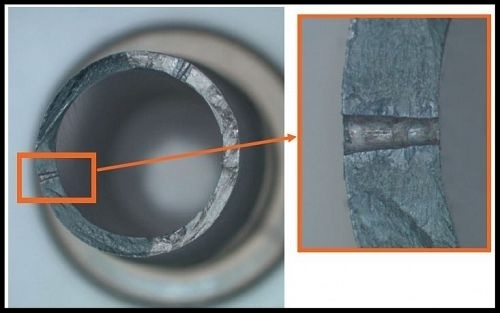 Photographic evidence of the microstructures and hardness measurements were performed to be compared with the acceptable or expected range to provide further insight into the condition of the material. Providing database of gas turbine materials for creep-fatigue mechanism – In principle, creep is the dominating damage mechanism at most GT high temperature critical locations. In light of ETD experience, the effects of creep interactions cannot be ignored in HGP lifetime assessment. Therefore, ETD provided a materials database considering creep fatigue interaction mechanism of gas turbine materials. This was done by collecting data from various sources including ETD’s various industry and research links, published literature and its own sources. Submitting a Final Report – A report was then issued detailing the findings with photographic records including test results, data analysis, microstructure images and component integrity analysis results. For more information on our Life Assessment services please click here.